Jafar in Disney's Aladdin is called Abanazar in the Panto ... he's just as evil in both. I rode onto the stage, did a magic trick and got all the kids shouting and booing and cheering. No rehearsal required which was excellent. I'm in preparation for the professional panto I'm contracted into." We had our read through at Bexhill-on-Sea on Sunday, plus a costume fitting. I'm playing Abanazer this year in Aladdin and the director asked me if I can grow a moustache and goatee beard for the role. Mmm, not in 10 days I think, but I'll have a go. I suspect it'll be the old makeup whiskers coming out after a bit of a dark time in their box as I've been an ugly sister for the last 3 years. I should perhaps try to grow and keep a goatee beard as I am a sad, middle-aged, geezer now and I think that's what you have to do these days to attempt to recapture your youth. That and tight jeans. Perhaps it's time to re-image myself so that people only suspect that I'm a middle-aged sad old git, rather than know for definite, with my corduroy trousers and rather nice cardy. I've actually started looking for cardigans now with leather elbow patches, so I think I'll probably stick with that look. "I bet I'll get one on the Isle of Wight." I travel to the island on the 13th, we have 5 days rehearsal and then we go into the run. 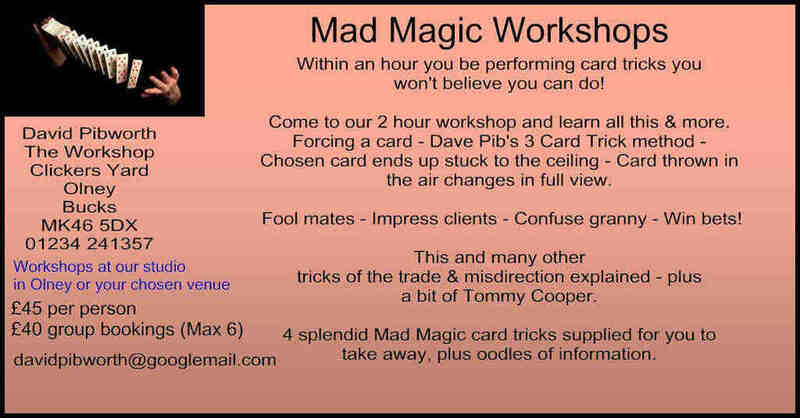 There's a couple of magic tricks which I need to get to grips with and they've set aside some time for those. It's the misdirection that I'll need to work on which is always tricky without an audience. I get 2 days off in the middle of the run when I go home and then I'm back for the last few shows. I quite like the nonsense of the ferry going across to the island, which takes about enough time to get a cup of coffee and have a flick through a newspaper. I always ask a member of the crew if they have prepared my state rooms, and did they tune the grand piano that I ordered. Some laugh, some look slightly concerned and others just walk away shaking their heads sadly. One of the things I like about the Isle of Wight was that last time I went there, they still had fire engines and ambulances with the old siren, so that when one went past, I could still say "He'll not sell much ice cream going at that speed". In fact it's little things like this that keep me going. Whenever I order a coffee from Costa or similar, I never tell them what size coffee I want, in the hope that they'll say, "Large one, sir?" and I can say, "Mind your own business, you cheeky blighter." My wife thinks it's quite sad that I spend part of my life silently encouraging people to give me a feed line to get one of my jokes in, but I argue that it's far better than being rude and wanting to kill people. I'm also on the receiving end as when I tell people that I'm in panto this year they do tend to say, "Oh no you're not" to which I gamely laugh uproariously and say, "Gosh, that is funny, I'd never heard that. I must remember it" and I try to be genuine as is possible after hearing the same joke 781 times. "But it would be churlish to groan." Actually, one good joke was after I'd been in a Shakespeare production in London, as I told someone I was going into panto and he said "When you go out on stage after this, do you think the audience will shout out 'It's beneath you'?". Anyway, that's my December sorted out and by the 30th December it'll be behind me. "Oh, no it won't ... oh yes it will." Feel free to carry on ad nauseum.